Joe Wos, like many artists, was the kid who was always drawing. He began his professional career at the ripe old age of 14, drawing at local festivals and events, and by age 21 he began a working as a performance cartoonist with the Children’s Museum of Pittsburgh, telling stories while illustrating them live on stage. Joe was asked by the Charles M. Schulz Museum to be the presenter at their grand opening in Santa Rosa, CA. During that trip, he also got to visit the Cartoon Art Museum of San Francisco and was inspired to start a cartoon art museum of his own in his hometown of Pittsburgh, Pennsylvania. Over the course a decade he ran the ToonSeum, growing from a small gallery in the Children’s Museum into its own three gallery entity in downtown Pittsburgh. 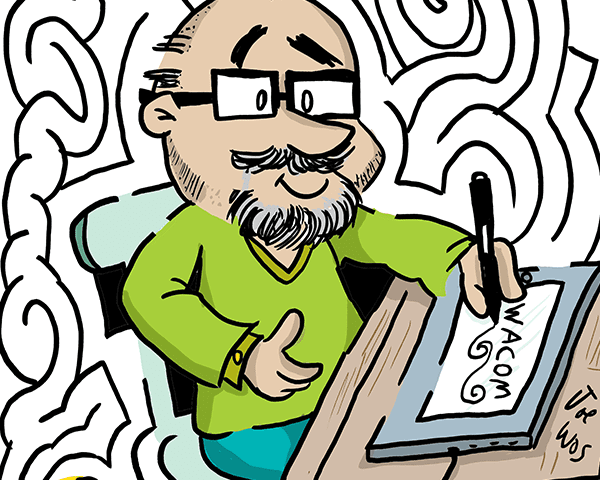 After seven years he grew tired of hanging other people’s art on the walls and decided it was time to pursue his own dream of becoming a syndicated cartoonist and published illustrator. At age 44, he finally embarked on fulfilling the promise he had made to his childhood self. Joe tried to figure out what set him apart from other artists and settled on his work in illustrated mazes. A few years earlier Joe had set the world record for largest hand-drawn maze. He put together a packet of mazes and sent them off to Creators Syndicate. Less than a week later he had a positive response and a few months after that, MazeToons began appearing in a handful of newspapers nationwide. Joe had fulfilled his lifelong dream of becoming a syndicated cartoonist, but it didn’t end there. With his newfound confidence and skill improvement, he reached out to an agent to pitch maze books, and shortly thereafter, had a deal with B.E.S. Publishing to print his first book of mazes, A-Maze-Ing Animals, followed by Myths and Monsters, Maze-O-Zoic and A-Maze-ing America.